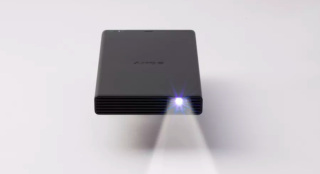 Sony announces pocket-sized projector for your portable pleasure | What Hi-Fi? …Although unless you’ve got a super steady hand you’ll probably want to put it on the floor, table or a tripod. 8cm wide, 15cm long and weighing only 280g, the MP-CD1 is a portable DLP projector designed for on-the-go use - a far cry from the company's high-end home cinema projectors, then. Joining a recent flurry of portable projectors on the market (see below), it can, for example, beam a 120-inch screen to any surface from 3.45m, with a resolution of 854 x 480 (just better than a standard definition) and a brightness of 105 lumens. Texas Instruments’ proprietary DLP IntelliBright processing technology aims to boost brightness without compromising on battery consumption. To that end, its 5000mAh promises two hours of battery – good for a fair few episodes of Friends, then – before requiring a recharge via its USB-C port. The MP-CD1 will be available in Europe next month, priced approximately €400.